In their 3rd Match CCL Season 2014 Kerala Strikers Is Fighting Against Chennai Rhinos. Kerala Strikers Vs Chennai Rhinos match Date Is at 9th February 2014 (Sunday). And The Tie of The Match Is at 7.00 pm to 11.00 pm. Kochi Will Host the Kerala Strikers Vs Chennai Rhinos Match. Kerala Strikers Team Had done an excellent Opening At Celebrity Cricket League Season 4. They Have Played 2 Matches and Won All The Two. They have scored the winning Runs in Last Ball in Both the Matches. 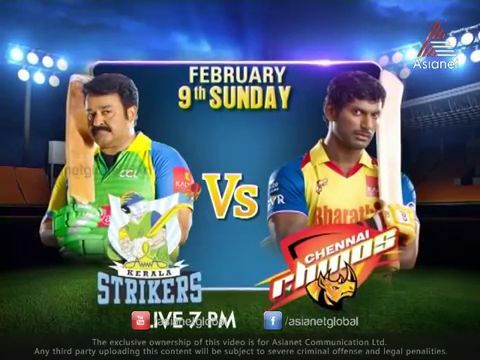 Kerala Strikers Vs Chennai Match Live On These Television Channels – Asianet, Rishtey and Star Vijay. 1st Match Against Telegu Warriors – They Won by By 4 Wickets – Telegu Warriors Scored 142/6 in 20 Overs. Kerala Strikers Chased The Score in 143 in 20 Overs (6 Wickets). Won The Mach By 4 Wickets. 2nd Match Against Veer Marathi – Opponent Scored 124/9 In 20 Overs. Kerala Strikers Team Chased Target 127/7 In 20 Overs and Won the Mach by 3 Wickets. This Is The 12th Match at Celebrity Cricket League Season 4.